Hi I am having an issue when streaing via Airplay to one of my devices. The device in question is the Marantz SR8012, when i start playing through it over Airplay, it stops the music after 5 to 7 seconds. Tested it using Itunes and it streams OK, without issues. I also have an Audio Pro A10 and there is no issue with it. Grouping the devices also has the same effect where the music stops after 5 to 7 second. Can you share screenshots of Device Setup for this Zone in Roon? Do you have DSP Enabled? Does this occur with all content or just specific content (local vs streaming, file types and qualities, etc.)? If you play to System Output of one of your remote devices do you have similar issues or do things work okay? I do not have the DSP active. Aside from 1 Drs album all my files are flac files. On the flac files I would say about 80 to 90% are 16bit 44KHz. Will have to test, but so fare the issues is with flac with 16bit 44KHz. On my network I have 1 Audio pro A10 that I can link via Air Play and works well. I also have linked to the Marantz SR8012 a piBerry with a digi+ pro. The piBerry is linked via a coax cable to the SR8012 internal dac, and works well. Hope this information may be of some help. I’ve uninstalled roon (program only) and didn’t have any effect. Also, I’ve been playing a bit with the device settings and in sertains situations if I change the volume control from “device volume” to “Fixed Volume”. I can have about 40 seconds of music, then it stops , if I then play it again it stops right a way. Thanks for the info here, @Filipe_Cunha. Do you receive any specific error in Roon when playing back to this device? Is this device connected to the network any differently from the Audio Pro A10 that does work via Airplay? I don’t get any error message box on roon. The Audio Pro A10 gets his signal over WiFi where the Marantz gets it over LAN. On the A10 path there is also a WiFi repeater. Is there any place I can look for a log file? I’ve manage to get the issue partially solved. 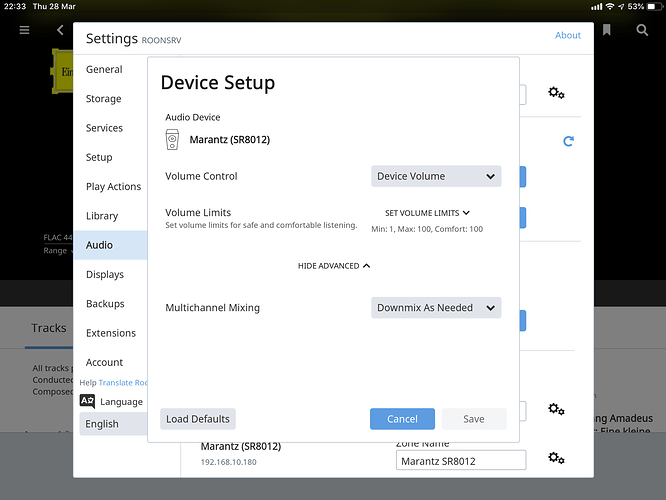 Using the Marantz online help, I’ve activated the IGMP proxy version 3 on the router, seems this will allow for the multicast. I’ve also checked the fierwall on the roon server and the MTU was set at 1500 on the roon server and on the router. Not shore if need to do any setup the roon side regarding on IGMP proxy? My current issue is when I group the Audio Pro A10 + Marantz SR8012 the issues is still present. So just to verify the Marantz now works on it’s own in Roon, but when grouped you’re experiencing issues? 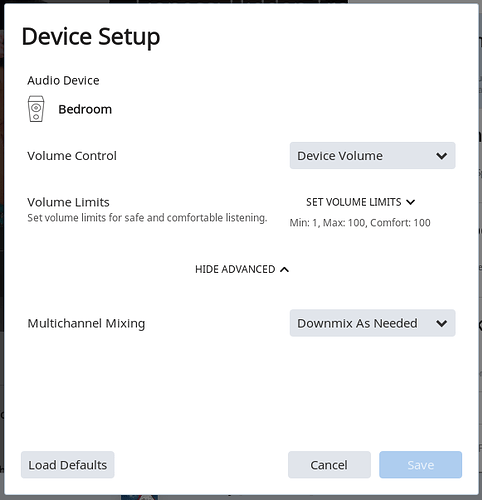 Can you share a screenshot of device setup for the Audio Pro A10? First, can you please reproduce the issue once more and note the time at which the issue occurs (i.e. the time you start playback and it doesn’t work). Then respond here with that time, and I’ll make sure we review the diagnostics related to that timestamp. If it helps to track the music was “We will Rock you” from Queen on Greatest Hits album.